My life work in the ministry grew out of a deep interest and love of singing gospel songs and hymns. My father being a community “singing teacher”, taught me to sing and lead singing when only a small boy. During my last two years of high school, 1909 and 1911, I was training church choirs and leading them (during) ‘Fifth Sunday Singing Conventions’. Also, I was leading the song services for pastors and evangelists in ‘revival meetings’ in different churches of my home community and county. On finishing high school, I had a semester of Voice, Theory, Harmony, and Song Directing in Bacon’s Normal School of Music, Sevierville, Tennessee. From that school I entered the ministry of leading Gospel singing and singing solos for pastors and evangelists in North and South Carolina. In May 1912 I was called to Cranberry, North Carolina to train the church choir and lead the singing for a Union Revival Meeting in the Community Church. There I met Miss Dona Odam who became my wife at the close of the meetings – just 24 days! – and she has stood by my side in the ministry of song and sermon for 51 years! Possessing a sweet alto voice, we formed a duet – Tenor and Alto – and travelled seven years (before we had any children) conducting song services for pastors, teaching singing schools, representing song book publishing companies in conventions throughout the South and Midwest. During the early years of our singing ministry we became acquainted with the noted evangelistic party of that era : the Dr. Wilbur Chapman – Charlie Alexander Party. During this association God graced me to hear and receive the wonderful truth and blessing of ‘justification by faith’ from Dr. Chapman. Also, it may be of interest to know that Dr. Chapman preached one Sunday morning from the subject, ‘the Ivory Palaces of Heaven’ – Psalm 45:8. That afternoon Henry Barraclough, pianist for the party, wrote the words and music of the song, ‘Ivory Palaces’, and I sang it in the evening service! Incidentally, Dr. Chapman started with Billy Sunday. Mr. Sunday was saved one night in a Chicago Mission, while playing his last year with the Chicago White Sox. He entered YMCA work for a while, then later became Dr. Chapman’s Tabernacle Custodian and conducted shop meetings until he met Home Rodeheaver (a Tennessean), and thus formed the Sunday-Rodeheaver Party. Concluding our ministry with the Chapman-Alexander Party, we became associated with the ‘Cyclone’ McLendon – Pledger Evangelistic Party in South Carolina from late 1914 into 1915. In the school year of 1915 and 1916, I was Music Director, teacher of Voice and Public Speaking in Milligan College, Tennessee. Being deeply interested in the Scriptures, I took advantage of my opportunity and enrolled for the Bible Course on Evangelism, and was ordained in the spring of 1916. That summer I spent three months in New York City pursuing special study in Voice, Harmony, and Public Speaking. During the fall and winter of 1916-17, I became instructor of Voice and Evangelistic Singing in J. D. Vaughan’s School of Music, Lawrenceburg, Tennessee. There I met Virgil O. Stamps, and became second Tenor and Soloist with him in Vaughan’s National Quartet, and travelled widely throughout the South and Midwest. Introducing Vaughan’s Song Books in churches and singing conventions in 1917 and through summer of 1918. The school year of 1918-19, I was principal Cranberry (NC) High School. Summer of 1919, I had a special course in Voice and Public Speaking under Eugene Feuchtinger in the Perfect Voice Institute of Chicago. In the fall of 1919 to the spring of 1920, I was again teacher of Voice and Singing in Vaughan’s School of Music. In the summer of 1920, I became a teacher of Voice and Evangelistic Singing in Homer Rodeheaver’s School of Evangelistic Singers, Winona Lake, Indiana. During this season, God graced me with the opportunity and opened the eyes of my heart to receive with spiritual understanding the grand truth of ‘universal reconciliation’. Being profoundly interested in the Scriptures and seeking every opportunity and aid I could find for maturing my knowledge and understanding, two wonderful doors opened for realizing the prayer of my heart concerning God’s Purpose of the Ages, and His Administration and Dispensations. First of all I was privileged to meet and hear Dr. G. Campbell Morgan of London in Lecture Studies in the Scriptures for ministers. There I learned from Dr. Morgan about the five AIOONS, or Ages, and the twelve Administrations and Dispensations of the Scriptures. The shock and unspeakable blessing came into my spiritual life when sitting in a study session with a large group of ministers, and heard Dr. Morgan’s exposition on Matthew 25:46, that “there is no word in the whole Book of God corresponding with our eternal which, as commonly used among us, means absolutely with end.” During this session I had many private conferences with Dr. Morgan and received many illuminating helps on my inquiries concerning the many perplexing questions overwhelming me; and was advised to procure Rotherham’s Emphasized Bible, also the Emphatic Diaglott, and Englishman’s Lexicon and Concordance. Then followed my second find and illuminating blessing, Clarence Larkin’s book, Dispensational Truth, or God’s Plan and Purpose of the Ages. On finishing the season with Mr. Rodeheaver, I was engaged by the pastor of the First Baptist Church of Muncie, Indiana as Music Director and Soloist, the purpose in view to train a choir of 100 voices for a Christmas Cantata, Christmas of 1920. During my spare minutes and hours, day and night, I was devoting prayerful study, research, and work preparing and drafting my first chart, God’s Purpose of the Ages and Administrations, at the same time correlating the truth and compiling a series of lectures explaining Gods’s Plan and Purpose of the Ages. In January 1921, I returned to Lawrenceburg, Tennessee, as teacher of Voice and Singing, in Vaughan’s School of Music. During this time I secured a painter to paint my first chart of God’s Purpose of the Ages, designed in the colors as you know it today, except in circles rather than panels as it was redesigned in 1925; and redesigned again in 1938 with more details worked in; the original chart was 16’ by 5’ in size. In the summer of 1921, I was back again in Winona Lake, Indiana, teaching Voice in Mr. Rodeheaver’s School for Evangelistic Singers. During this season, Mr. Rodeheaver formed the Rainbow Recording Company, and brought together the ‘Rainbow Quartet’, the personnel being Dr. Frederick Martin, Basso of the Metropolitan Opera Company, Homer Rodeheaver, Baritone, Adlai Loudy, Second Tenor and Soloist, and Dan Beddoe, noted Welsh singer, First Tenor. We made many sacred song recordings of the popular numbers of the era, and, incidentally, I can listen to the recordings today, being the only living voice fo the quartet! In the fall of 1921, I was awarded a scholarship in the Cincinnati Conservatory of Music to pursue my study in voice and concert singing under Don Beddoe. During the semester I filled engagements as soloist in various churches on Sundays, and for clubs and concert programs, as a result of which I received a most favorable contract offer from a booking agency for promoting me in a concert singing career. (But) my definite calling for the ministry enabled me to unquestionably and without regret forgo the auspicious and promising opportunity. 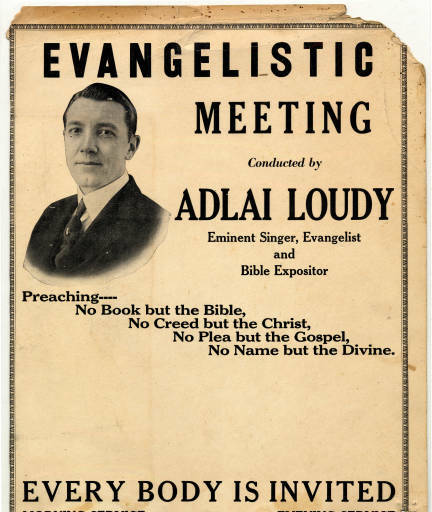 Returning home, a door opened for directing the singing for George E. Moody Evangelistic Party from the summer of 1922 until the spring of 1923. That spring I was engaged to direct the singing for Dr. Trigg Thomas, Southern Presbyterian Evangelist, during which we filled engagements in Tennessee, Kentucky, North Carolina, Mississippi, and Florida. During this time and ministry, I had much time for study and preparation of messages on the various ages, administrations, dispensations, and other phases of the truth ‘rightly divided’. Terminating my services with Dr. Thomas in the late summer of 1923, I began my full time independent Bible Lecture Ministry of ‘God’s Purpose of the Ages’, using my big colored chart. My first ministry was held in Riply, Mississippi. Then followed engagements with churches in Campbellsville, Kentucky, Carrolton, Mississippi, Spray, North Carolina, Christian Church, Johnson City, Tennessee, Mooresboro, North Carolina, Heaton, North Carolina, Spartanburg, South Carolina, Batesburg, South Carolina, New Albany, Mississippi, then back to Riply, Mississippi, July 20 to August 10, 1924 using a tent for our crowds. Then followed an engagement in Christian Church, Hickory Flats, Mississippi, August 17-31, 1924. This date is underscored, because, during this meeting, I received from Mr. A.E. Knoch, a bound volume of the Concordant Version (incomplete) of the New Testament, also a large package of literature including ‘The Mystery of the Gospel’, or ‘The Divine Mysteries’. In Campbellsville, Kentucky, October 1923, an interested listener gave me ‘All in All’, ‘On Baptism’, and the paper bound copy of the ‘The Unveiling’ of the Concordant Version. This was a most invigorating and encouraging experience for me to learn of someone else believing and teaching universal reconciliation. In a few weeks I wrote Mr. Knoch and received the following reply. I have been praying for many years that the Lord would raise up someone to go out and make the teaching known to the people. I trust you are the man. But remember we have no organization to join and I am not sending you out. I will cooperate with you in every possible way in the interest of the work, but you must look to the Lord for your guidance. Beginning in September 1924 through November 1926, I was filling engagements for Bible Lectures of God’s Purpose of the Ages, using my large colored chart of the ‘Ages’, in Blountville, Tennessee (my old home community county seat), Garbers, Tennessee, Oakdale, Tennessee, Kingston, Tennessee, Lenoir City, Tennessee, Townsend, Tennessee, Marysville, Tennessee, Pennington Gap, Virginia, Rossville, Georgia, Atlanta, Georgia, Starnes, Kentucky, and Cosburn, Virginia. November 12, 1926, I was called to Wagener, South Carolina for a meeting which began with wide interest that increased through the first two weeks, until a larger building had to be secured, and continued to increase in interest until our close on December 12, 1926. Out of this meeting began the great work in that section of South Carolina, which has continued until the present time, the work being later located at Fairview Crossroads where the new building has now been completed and was dedicated June 7, 1964. Sunday, January 9, 1927, I began meetings in Pittsburgh, Pennsylvania, being called there by the late Brother Menta Sturgeon, former secretary with Pastor Russell. For five weeks we ministered to a large hearing of mostly ex – IBSA (International Bible Students Association) students on ‘God’s Purpose of the Ages’. My next ministry was in Detroit, Michigan, being called there by Brother Frank C. Lyons, at the request of the late brethren, Dr. Thompson and Brother Sullivan, former associates of Pastor Russell, February 27 to March 27, in the Savoy Hotel Auditorium, seating 300, with capacity hearings and joyful reception of the teaching. Closing in Detroit, I went to Almont, Michigan, April 3 through 27, 1927. While in Almont, I was called by telephone from Montreal, Quebec, by the late John I. Brown, to come and serve them in the ministry. Returning home after the Almont meetings, we made preparations for going to Montreal. Brother Sturgeon, knowing the wide interest among IBSA students, arranged appointments in various cities for speaking engagements of a night or two with groups of interested ones along our way. Arriving in Montreal, we had three weeks of wonderful meetings in Glad Tidings Hall, with capacity audiences from May 22 to June 12, 1927. On finishing in Montreal, we were called to Kitchener and Toronto, Ontario, for two week each of meetings. On closing, we returned home, stopping with interested friends along the way. On reaching home, I had word from the late Brother Fred Misegades to come to Chicago for meetings with interested friends, both of the ‘Concordant Class’ and the wide number of IBSA friends. There I spoke three weeks, September 4 through 1927, with many standing. There Brother Shakespeare came into the faith with us. During my stay with Brother and Sister Misegades, and son, Keith (then in school), Brother Misegades suggested that I put the progressive order of lecture series I was giving in chapter form for a book, and God’s Eonian Purpose was decided on and planned. I laid out and prepared the chapters similar to the order of the lectures I was giving from my large chart. I sketched the charts and illustrations and cover design, and my esteemed friend and co-worker, the late Brother Fred H. Robison (author of Are Bride and Body Identical?, and formerly secretary and assistant to Pastor Russell), put them in final form for the plates. Brother Misegades supplied the paper and binding material and helped in making the printing and publication of the book possible.